Play together with friends to build imaginative, awe-inspiring worlds. Compete in heart-pounding matches that require quick thinking and fast reflexes. 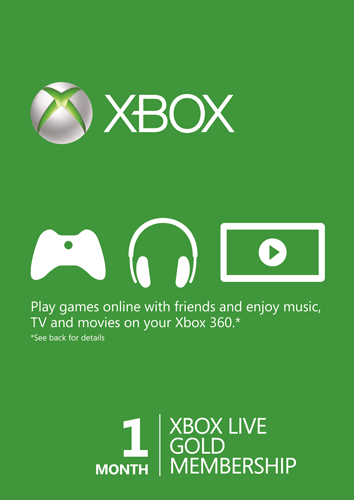 Whether you are in the mood for cooperative or competitive gameplay, Xbox Live has something for everyone. With the world's premier gaming community, there is always someone ready to play matching your skill and style. Twice a month, Xbox Live Gold members get exclusive access to a hand-selected collection of fan favorites, big hits, and bold new visions - for free. Each week, Xbox Live Gold members can save up to 50-75% in the Xbox Store with exclusive discounts on select games, add-ons, and more. Xbox Live Parties are built to help you stay connected and more easily play games with your friends. Quickly group up, voice chat, and move smoothly in and out of games together. Or choose to keep the conversation going while members of your party play different games, now even between Xbox One and Windows 10 PCs. Experience games before you buy them with free access to game demos. Tune in to Netflix Hulu Plus, Twitch, Crackle, Amazon Instant Video, Machinima, and more popular apps on Xbox One. Cheer for your teams and keep up with the latest action with live and on-demand sports from MLB, NFL, NBA, WWE, ESPN, and more. Experience the newest hits before they hit the street with access to exclusive Xbox betas. Chat with friends on your TV in stunning HD with Skype for Xbox One. With this specially designed version of the popular app, you use Snap mode to connect with friends near and far while you watch TV or play a game. Enjoy free over-the-air channels like NBC, CBS, and FOX with the Hauppauge TV tuner. Catch the latest on ESPN, AMC, CNN, and more, live with Sling TV. Or use the HDMI pass-through and OneGuide to take more control of your cable TV.